I finally received the Act Labs light gun that works with a Television. It has a USB connection and when I tried to add a USB card to the old Packard Bell, I realized their were no empty PCI slots left. I have two daughters always fighting for computer time, so it was pretty simple to get my wife to agree to move the old arcade computer upstairs and replace it with a faster computer, with more room for expansion. I got a great deal on a Biostar motherboard complete with a case and a 2.4 GHz Pentium CPU. An 80 gig hard drive and CD-ROM from Best Buy were 100.00 after rebates. I upgraded from Dos Mame to Mame32 and attached the light gun. Works GREAT! Only catch is I sometimes have to adjust the alignment when I first start the computer. The new computer has an 80 gig hard drive so I was able to get the games that required CHD files like AREA 51 and Carnevil. Gun works great for these games. Here is a close-up of the gun inside the holster I made for it. The holster is made of a very soft cloth material and protects it well. 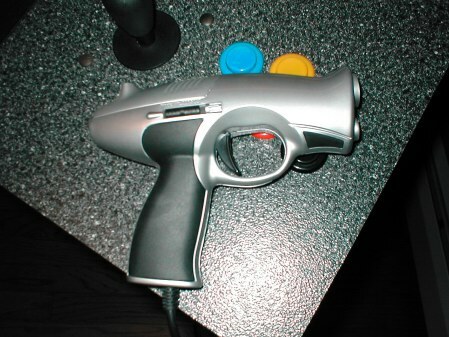 Here's a close up of the gun itself. It's fairly sturdy as my two daughters gave it quite a work out. I wish it looked a little more like a gun though then a gamma ray shooter. 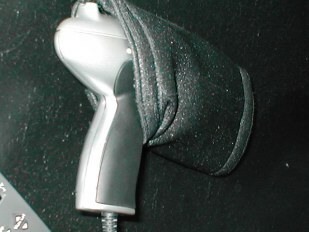 This is a picture of the right side of the machine where the gun is holstered. You can also see where i keep the remote control for the television. 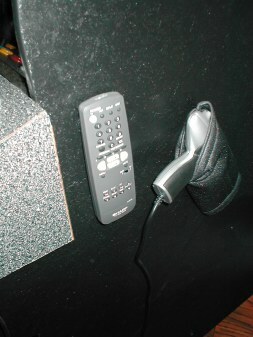 with the control panel being a few inches wider then the cabinet, you cannot notice the remote control at all. Industrial strength velcro has held it on for years now.